Mary Charlotte Ward Granniss Webster Billings (July 11, 1824-March 2, 1904) was a Universalist author, activist, and hymn writer. The wife of two Universalist ministers, she herself was ordained in 1892. Kind and generous, she exemplifies the nineteenth-century liberal missionary zeal that spread Universalism to the west. Mary Charlotte Ward was the 14th of 16 children born to Charlotte Munger and William Ward of Litchfield, Connecticut. Most of the members of this deeply religious family attended St. Michael's Episcopal Church in Litchfield, which her paternal great-grandfather, the Rev. Solomon Palmer served until his death in 1771. Palmer, who studied in England, was a Presbyterian until he joined the Episcopal church in 1754. Around 1830, one of Mary's older brothers, probably Henry (b. 1805), converted to Universalism under the influence of Reverend Menzies Rayner, Universalist minister in Hartford, 1827-31. In turn, Henry persuaded his mother, Charlotte, and eventually Mary also, to convert. With no Universalist congregation in Litchfield, the Wards practiced their new faith privately. Litchfield was a large and culturally sophisticated town at the time, the home of Tapping Reeve, America's first law school, and the Litchfield Female Academy. Six of Mary's older brothers and sisters attended the Female Academy as part of their schooling. After the death of nine siblings, when Mary was about ten years old, her parents removed her from the academy to school her at home. She read the classics and roamed the countryside. Mary married three times, and while she was devoted to her husbands, she was not defined by them. All three marriages reflected her deep commitment to family and home, but they also allowed her literary creativity and religious drive to shine through. In 1845 she married Frederick Granniss, a wealthy silk merchant also of Litchfield. The couple moved to Hartford for better business opportunities in 1851. Here they lived a good life that included a beautiful home in West Hartford (nicknamed Lilfred's Rest), extended European travel, and Mary's first chance to worship with a Universalist congregation. At the Hartford Universalist Church, Mary worked with the Sunday School, participated in women's circles, and composed celebratory hymns. Frederick served as Sunday School superintendent for several years. Unfortunately, Frederick's health was poor. Mary devoted herself to his care until his early death in 1866. Nearly all her life she had one or more relatives in her care. Mary and Frederick had no children, although several of her writings suggest that they lost one or more infants in childbirth, possibly before the move to Hartford. In some ways, her compositions became her progeny. Her first book, Emma Clermont, appeared in 1849. During her twenty-four years as 'Mrs. Granniss,' she published dozens of short stories, poems, and hymns in Universalist magazines, including the Ladies Repository, Rose of Sharon, Lily of the Valley, the Trumpet, as well as various secular journals. The journal she kept on her extended tour of Europe, 1859-60, appeared in Ladies Repository in 53 installments from September 1860 to June 1865. Although fully engaged in writing and publishing, she found time for reform work. This was partly facilitated by her connections with other independent Universalist women, such as Caroline Soule, Phebe Hanaford, and Mary Livermore. Nevertheless, her orientation remained domestic: while committed to promoting Universalism, she did so primarily through writing and benevolent work, acceptable ministerial activities for mid-century women. Through her first marriage and widowhood, she apparently did not consider the public role of preacher. After Granniss died, Mary remained in Hartford with her older sister, Ellen. In 1869 Mary married Charles Henry Webster (b. 1817), a native of Georgetown, Massachusetts, who had been in the Universalist ministry in Connecticut since 1843. He had served churches in East Lexington, South Dedham, East Boston, and Chicopee, Massachusetts; Auburn and Lewiston, Maine; and Collinsville and Granby, Connecticut. He was also a chaplain in the Civil War and the Universalist missionary for Connecticut, 1867-69. His first wife, also named Mary, had died in 1868. The Websters settled in Rocky Hill, a small village south of Hartford. He left the ministry to run a bookstore. As the wife of a minister with a missionary bent, Mary expanded her church work into public ministry. In 1872 she served as the vice-president of the Women's Centenary Association (WCA) of Connecticut (the national WCA was originally founded in 1869 to raise money for the 1870 Universalist centennial). 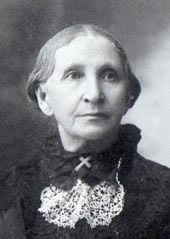 Her work with the Connecticut Universalist Convention brought her into contact with women ministers in her state, notably Olympia Brown and Phoebe Hanaford. In 1871 Mary preached her first public sermon in Hanaford's church in New Haven. Afterwards Mary engaged in supply preaching throughout the state. She was also active in the Women's Ministerial Conference (founded by Julia Ward Howe in 1873). Charles died of pneumonia in 1877. Widowed a second time, Mary, age 55, continued her ministry and writing. She earned a place in E. R. Hanson's 1882 compendium of 157 Universalist women, Our Woman Workers; published her second book, The Wonderful Christmas Tree, 1882, an illustrated childrens book; and eleven of her hymns appeared in Women in Sacred Song, 1884, a reference anthology of 2,500 hymn texts by over eight hundred women authors, including Hanaford and Howe. Well-connected and respected, Mary could have remained in Connecticut for the rest of her life. Instead, she took a radical step. She moved to Texas where she married Rev. James Billings, the state's new Universalist missionary. Mary was 61 and James was 74. Like Webster, Billings had an active career as a Universalist minister and publisher. Mary may have met him in the early 1880s, when he first received support from the Women's Centenary Association for mission work in Texas. The Billings were committed to spreading Universalism in Texas, as evidenced by their many administrative reports, sermons, and other theological writings published in the Universalist Herald, the Christian Leader, and elsewhere. Almost single-handedly, they established the Texas Universalist Convention, personally filling nearly every office at one time or other. Mary was a committed corresponding secretary, taking full advantage of the post office to help spread liberal religion into rural areas of this large state. They established the state mission center in Hico, a fledgling cotton town on the Texas Central Railway, about 75 miles southwest of Dallas-Fort Worth. In Hico they made sound real estate investments on behalf of the Texas Convention and opened All Souls Church in 1889, the same year that Mary was licensed to preach. Reports about membership in Hico vary, listing between 90 and 300 members. At the 1892 annual meeting of the Texas State Convention, Mary was ordained to the Universalist ministry. For a few years after James died in 1898, she continued his circuit preaching. Francis Skinner, a woman from Hartford, became her living companion. She also built up a small network of woman ministers in the southwest. Among these were Rachel Dallgren Billings (her step-daughter-in-law), Athalia Irwin, Marguerite Hess, Marianne Folsom, and Meekie Dunoway. Despite the particular challenges to growing a church in the southwest—extremes of weather, great distances, cumbersome travel, the unpredictable agrarian economy, and religious conservatism—during the Billings years congregations were created and Universalist membership grew significantly. After Mary's death, Texas Universalism declined. The Texas Universalist Convention continued until 1929, but never with the same focus or vigor as when James and Mary Billings were alive to lead it. There is archival information on Billings and Universalism in Texas in the Universalist Special Collections at the Andover-Harvard Theological Library in Cambridge, Massachusetts. In addition to the periodicals mentioned above Billings contributed to the Christian Leader, the Universalist Leader, the Guiding Star, theUniversalist Herald, and the Gospel Banner. There are entries on Billings in Elizabeth Brooks, Prominent Women of Texas (1896); Phoebe Hanaford, Daughters of America; or, Women of the Century (1882); E. R. Hanson, Our Woman Workers: Biographical Sketches of Women Eminent the Universalist Church for Literary, Philanthropic and Christian Work (1882); and Catherine Hitchings, Universalist and Unitarian Women Ministers (sec. ed., 1985). There is a piece on her, "Biographical Sketch: Mary C. Granniss," in the Trumpet and Universalist Magazine (March 5, 1859), and obituaries in the Universalist Register (1905) and theUniversalist Leader (April 30, 1904). See also Oscar Harpel, ed., Poets and Poetry of Printerdom: A Collection of Original, Selected, and Fugitive Lyrics Written by Persons Connected with Printing (1875); Eva Munson Smith, Woman in Sacred Song (1885); Stanley Manning, The Universalist Church and Texas (1922); "Fifty Years Ago in Texas," Christian Leader (November 28, 1936); W. H. Rollins, "Universalism in Texas," Christian Leader (October 22, 1938); and Donald Watt, From Heresy Toward Truth: The Story of Universalism in Greater Hartford and Connecticut, 1821-1971 (1971). Main Page | About the Project | Contact Us | Fair Use PolicyAll material copyright Unitarian Universalist History & Heritage Society (UUHHS) 1999-2016CREDIT LINE: From the biography of _______ written by ________ inthe Dictionary of Unitarian and Universalist Biography, an on-line resource of the Unitarian Universalist History & Heritage Society.